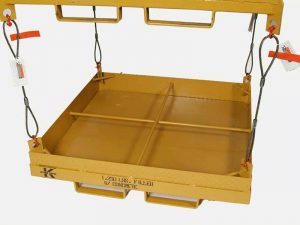 The first and most crucial safety tip for use of a crane man basket is to ensure the crane being used is stable, certified and prepared to perform the lift, as per OSHA/ASME regulations. Our crane man baskets feature 42”-high mesh on the sides, a self-closing swing-in front door with latch, a re-enforced mesh roof and four hook points on top, to attach the basket to an overhead lifting device. Remember to keep the crane operator’s manual on hand at the job site, and if you’re working with more than one crane, have a lift plan prepared in advance. The employee who will be working inside the basket should be outfitted with all the necessary safety gear, including a hard hat, safety glasses, harness and lanyard for tying off to the basket. At the work site, install a barricade covering the full swing radius. Set the crane’s brakes and place the outriggers on pads or a solid surface. If using on a mounted platform, install wheel chocks to prevent motion. All hooks and attachment mechanisms must close and lock, to prevent accidental opening. It is mandatory to test the crane basket every time before a lift is performed. This is why our crane baskets also come standard with a test weight. Test weights should be rated 1.25 times the capacity for the basket. Just remember to detach the weight after the test, so that you’re not lifting both the weight and a human together. Be sure to also check the crane controls and all other safety devices. And once a worker enters the basket, raise the basket several inches and inspect to ensure rigging lines are clear and undamaged, primary rigging is centered, weight is evenly spaced inside the basket, and the crane remains stable. OSHA/ASME rules state the basket must also have a separate grab rail to tie off to. Our crane man baskets feature a full-perimeter safety harness hook-up, which allows personnel to be attached almost anywhere inside the basket. Never tie off to an adjoining structure. Harnesses must be worn and attached by lanyards to designated anchoring points at all times. Be sure your crane driver is properly trained and licensed. It is also essential to have a trained ground standby person to guide travel and operation of any mobile crane, whether working indoors or outdoors. Also, the worker in the basket and the crane driver should be in constant contact (visually, walkie talkies, etc.). Do not move the crane or outriggers when the boom is elevated for use, regardless of whether or not someone is in the basket. Also, do not raise the basket in windy or poor weather conditions, such as rain, sleet and snow. Workers should keep all body parts inside the basket when it is being lifted. Never climb onto the guardrails while the basket is in a lifted position. Explore more of our website to learn more about our crane man baskets today!